Nam Hwa Opera rounds off its 55th anniversary celebrations with the world premiere of a brand new Wuxia Teochew Opera! Titled The Severing Sword, the opera will premiere in March 2019, and be directed by Toy Factory artistic direction Goh Boon Teck. Based on a popular wuxia novel by genre master Liang Yu Sheng, The Severing Sword follows a series of unfortunate events set into motion by men hungry for the legendary Kun Wu sword, promising ultimate power to those who possess it. Families and lovers are tragically torn apart in the bitter struggle for the sword, nurturing resentment and hatred that fuels a meaningless and devastating quest for revenge as fates become intertwined and long hidden truths are revealed. 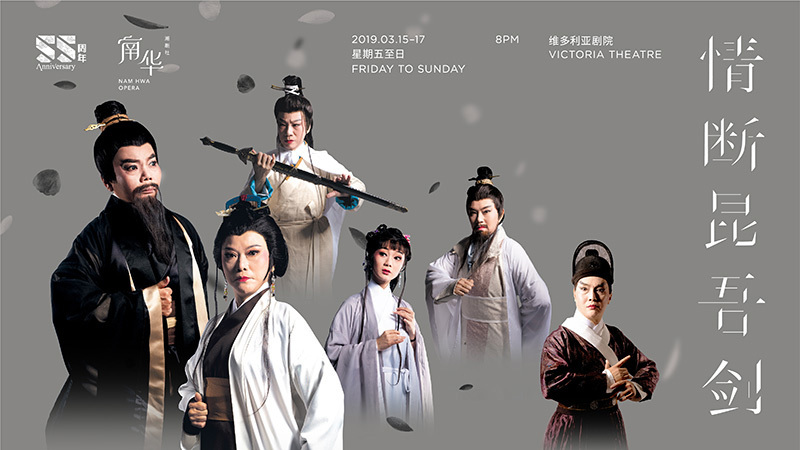 Adapted for the stage by playwright Huang Jian Feng and award-winning Teochew Opera composer Wang Qing Su, this performance will be helmed by six of Nam Hwa’s top Teochew Opera performers, namely Tan Kah Noi, Rita Lee, Lee Mooi Ching, Li Lvqiao, Wendy Lee and Anthony Tan. Working together with some of Singapore’s best designers, along with 11 students from ITE College Central, The Severing Sword also aims to push local Teochew Opera to new frontiers technologically and aesthetically, appealing to both new audiences and existing enthusiasts. Come catch this epic cautionary tale and timely reminder of how power corrupts and corrodes our innocence, leaving only a trail of destruction in its wake.